High Elevation Rock Festival, fueled by Monster Energy, returns to Fiddler's Green Amphitheatre presented by Subaru just outside Denver, Colorado, with an extra night of music — Friday night, September 22 and Saturday, September 23. 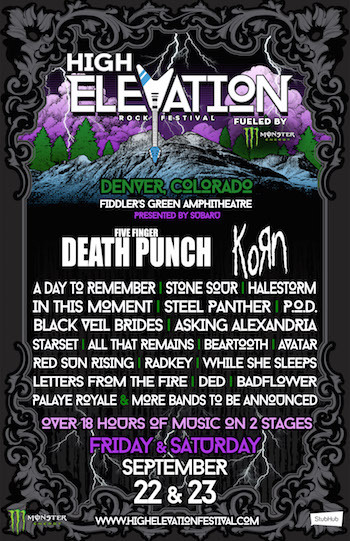 After its one-day debut in 2016, High Elevation comes back bigger and better in 2017 with a lineup of more than two dozen bands, led by Korn, Five Finger Death Punch, A Day To Remember, Stone Sour, Halestorm and more. "After an incredible inaugural event last year, we decided to turn it up a notch in 2017 and expand High Elevation to two days," comments Joe Litvag, Executive Producer of the festival for AEG Presents. "Now we've got 25 of the very best-in-class artists like Korn, Five Finger Death Punch, and Black Veil Brides performing more than 18 hours of music for the hard rock fans of the Rocky Mountain region to celebrate!"